Welcome to Carousel Double Glazed Windows Swarcliffe - specialists in double glazing windows and doors, box sash windows, replacement windows and conservatories. Our aim is to provide all of our customers with a first rate service - ask around and you'll fine plenty of satisfied customers! Our experience is only exceeded by our knowledge in providing a first rate service. By manufacturing and installing our own double glazed windows, we can keep track of every step along the way to ensure that you are 100 percent satisfied with our UPVC windows and doors, installed by expertly trained craftsmen, at affordable prices. We supply an extensive range of PVCU double glazing windows and doors, replacement windows and bespoke conservatories alongside installation and repair throughout Swarcliffe and all over Leeds. Carousel Double Glazed Windows Swarcliffe believe in putting the customer first which in return has played a massive part in making the company a success. There aren't many customers who can offer our level of customer service and attention to detail - detail which has meant that we have kept a huge 80 percent of business through personal recommendations! Starting in 1991, this family run business has prided itself in giving the very best in uPVC windows, door and conservatories. This has led to the team becoming a household name in the Leeds area. We've got a dedicated team of designers, surveyors and installation experts you can rest assured that you are in safe hands at every stage of buying and installing your double glazing. Carousel Double Glazed Windows Swarcliffe are very proud of their exceptional range of quality products French Doors, UPVC Doors, Roof lining, Sash Windows, PVCU Windows, Patio Doors and Conservatories. We're more than happy to talk you through our extensive selection of traditional, attractive and elegant double glazed windows and sash windows each manufactured for energy efficiency with Super Spacer Technology. 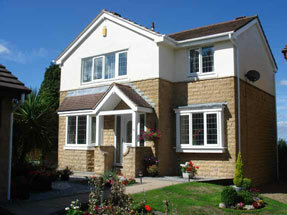 These can be fitted as vertical sliding, tilt and turn or as the standard casement option. Not only will these products keep your house toasty warm on cold winter's nights, but they'll provide second to none security with high security window features standard throughout. Alongside their fantastic range of windows, Carousel Double Glazed Windows Swarcliffe is pleased to offer a great range of UPVC doors. This stunning collection consists of PVCU Doors, Patio Doors and French Doors. All of the doors come with multi chambered frames to keep out the cold with inner panes of glass coated to reflect the heat back inside.